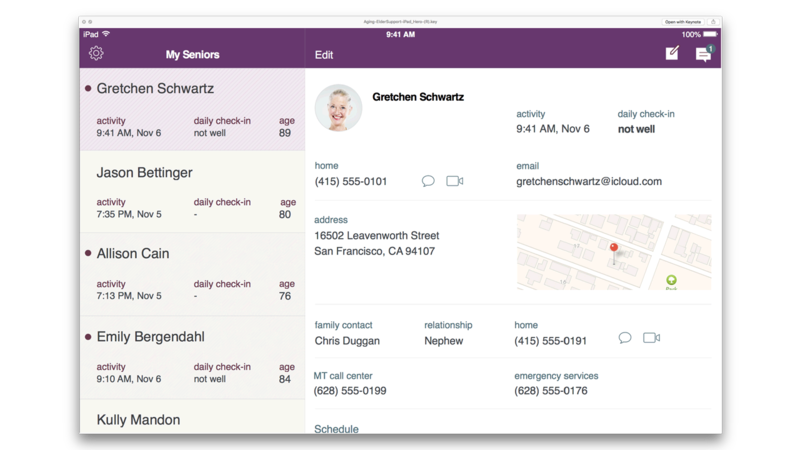 The app has a powerful management and communications console that allows support staff to oversee the needs of an assigned group of seniors, remotely or in-person. Real-time analytics trigger alerts and notifications based on the seniors activities. Service provider staff can rely on this information to assist them at home when needed. Analytics helps the Elder Support service provider to locate outside services that seniors at home may need, such as transportation to a medical appointment or food market. Location services and map functionalities simplify monitoring and navigation processes for the support worker. The apps Touch ID authentication provides a deep level of security assuring the senior and their loved ones privacy is protected.